It was the preferred drink of many of the greatest artists of the later Victorian era. Everyone from Van Gough and Manet to Hemingway and Picasso chose the Green Fairy as their muse in its heyday. It is for that reason that it earned its reputation as an artistic enhancer. However, in the early 20th century it began to be viewed as a dangerous substance and was systematically banned throughout Europe by 1915. It was banned in the U.S. for 95 years (1912-2007). There are many reasons why this happened. Absinthe is said to cause hallucinations, but this is just not true. Due to its high concentration of alcohol, it can cause a different feeling than other spirits. Thujone, in high doses, is a neurotoxin--but it would require more than 150 glasses of absinthe to be consumed in close succession before seeing any of the effects of the thujone. In other words, you would likely die of alcohol poisoning before seeing any green fairies! Nonetheless, its status as a mind altering drug grew to the point that the public began to view it as being more than just alcohol. Then there was the Jean Lanfray scandal of 1905 which was quickly taken up as a battle cry for the new temperance movement. On August 28, Jean drank two glasses of absinthe (and several liters of wine and a large amount of brandy) and then, after an argument with his wife, proceeded to fatally shoot her, his four-year-old daughter and then his two-year-old daughter with a rifle. He attempted suicide by shooting himself through the head, but survived. Despite the fact that he had been drinking hard liqueur since his lunch break that day, absinthe alone was blamed for his actions and demonized as “The Green Curse.” The temperance/prohibitionist movement ate it up and absinthe became the scapegoat for all alcohol. It was now said to cause madness and blamed for every social problem. Lanfray himself was found guilty, but spared the death penalty due to his state of “Absinthe Madness” at the time of murder. However, he hung himself in his cell three days after the trial. The Lanfray case was used to ban absinthe in Switzerland in 1906. 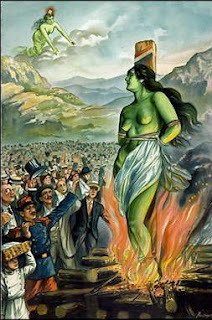 There was also pressure from the French winemakers, whose business was threatened by the popularity of absinthe. What made matters even worse was the fact that most of France’s vineyards were destroyed by a swarm of phylloxera louse (a nearly microscopic, pale yellow, sap-sucking insect) in the 1850s though 90s, severely crippling the industry. In 1910 France was consuming 36 million liters of absinthe per year, and the wine industry just couldn’t compete. 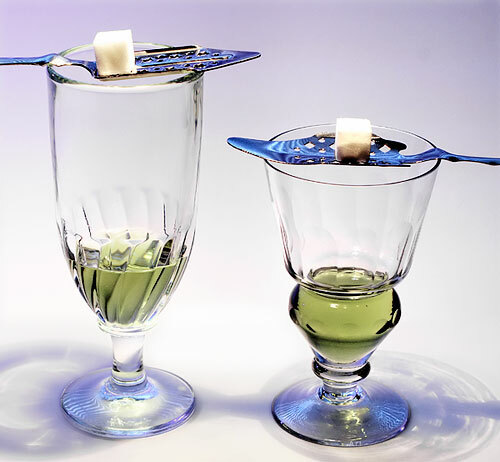 Absinthe was banned in France in 1915 and required a military order to carry out the feat of illegalizing the country’s most popular drink. The other night I had a few friends over to sample my small stock of absinthe. I prepared each glass identically with one once absinthe diluted with two ounces of water and one sugar cube. That is the traditional preparation method, but there is no reason why one cannot have it in a mixed drink. In total there were four of us partaking in the sampling. The guest list included my friends James and Jason, my wife Danielle, and of course myself. We had four different absinthes, all from different countries and all with unique backgrounds. After sampling all of them, we each ranked them in order from one to four with one being our favorite. Kübler is distilled in the birthplace of absinthe, the Val-de-Travers region of Switzerland. Kübler Absinthe was first produced in 1863 by Fritz Kübler. The distillery is currently run by Fritz’s great-grandson, Yves Kübler. The legalization of absinthe in Switzerland is largely due to Kübler's lobbying efforts and for that reason they were the first brand to be sold legally in Switzerland after the national ban on absinthe was finally lifted in March, 2005. It is made of all locally grown ingredients and is made according to the original recipe. 106 proof, 9 ppm thujone. The results for this one were actually quite surprising to me. I had had this brand before and prior to the sampling, this one was my favorite. However, compared to the other brands, this one is now my least favorite. Danielle, James and myself all ranked this one last and Jason ranked it number three. James found it so unpleasant that he did not want to even finish it. Jason, on the other hand, pointed out that it does leave a more pleasant aftertaste than the others, which earned it a better ranking with him. We all agreed that it has a deeper aroma and stronger alcohol smell than the others. After adding the sugar water, it becomes a very milky color, which Danielle thought reminiscent of Propofol. This is the first Bohemian-style absinthe available in America. They operate out of the old family store which is now called the Alt Wiener (Old Vienna) Schnapsmuseum in Vienna, Austria. The Fischers’ original Belle Époque absinthe recipe dates to 1881, and while the spirit has been banned in Europe and America for almost a hundred years, master distiller Gerald Fischer has resurrected his Great Grandfather’s secret recipe. Fisher Schnaps was founded 1875. Mata Hari (the Dutch exotic dancer that the brand is named for), was born in 1876, so the name of the brand is a newer addition. Highest level of thujone (10 ppm) legal in US. 120 proof. Both Danielle and James rated this one as their number one pick, and Jason and I rated it as our number two. It has a great minty smell. Jason observed that it is more cloudy than the others after dilution. We all agreed that it has a “warm fuzzy” feel going down. It has a more herbal taste and without the licorice taste of west European absinthe. James and I tried it straight, without any water to smooth it out. It is surprisingly smooth, even more so than top shelf vodka in my opinion. Mata Hari reminded James of the East German absinthe moonshine he tried while traveling through Europe when absinthe was still banned. Obsello is a brand of absenta (Spanish absinthe). Obsello is an award winning "Verte" or green absinthe that is manufactured by distillation from eight herbs including grand wormwood. The brand is unique among absinthes in that it is distilled from un-aged Spanish brandy or "eau de vie" made from Penedès wine. 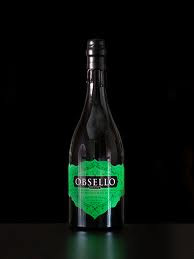 Obsello is distilled in Catalonia, Spain by an American expatriate and it is exported around the globe. The brand has won many awards and is considered one of the highest quality absinthes available internationally. 100 proof. Jason and I both picked Obsello as our top pick and Danielle and James both picked it as their number two. It has a more yellowish to light green color prior to louche. The bottle is UV-resistant and very attractive, but the wax dipped cap is a little difficult to open for the first time. (I cut it off with a kitchen knife; I do not recommend doing so if you’ve already been drinking.) It has a very clean, minty aftertaste and can easily be sipped. James and I tried this one straight also. It is definitely less sweet but not too bad. The Mata Hari is much better undiluted. Founded 1805, Pernod Fils was one of the first distilleries. 200 year old recipe. 136 proof. French. Pernod was the most popular brand through the 19th century. When Henri Louis Pernod opened the first major distillery in Pontarlier, France in 1805, the town would become the world’s center for absinthe production. Pernod Fils was the gold standard of absinthe. James, Danielle and myself ranked it as our number three and Jason named it his number four. Before dilution, it is very green (Pernod does use artificial coloring, however) that was very pretty. It smells much more of alcohol than the other brands. Jason and I both declared that it “has some bite” to it and is the least smooth to drink. It is one you may want to dilute a little more. While strong, it does have its charm and it will certainly get you drunk fast if that’s what you’re looking to do. All in all, it proved to be a very fun night filled with intriguing conversations one can only have over a few bottles of absinthe with good friends. The Green Fairy certainly enhances the evening and will bring the atmosphere of a Parisian salon to your home. It is worth noting that James did experience an unusually vivid dream afterwards. The dream was in full color whereas his normal dreams are not. Danielle and Jason did not report any out of the ordinary dreams. I usually have more vivid dreams and nothing stands out except that I did experience a bout of sleep paralysis on Tuesday night. Death in the Afternoon: "Pour one jigger absinthe into a champagne glass. Add iced champagne until it attains the proper opalescent milkiness. Drink three to five of these slowly." This one was concocted by Ernest Hemingway himself. I recommend that you use as fruity a champagne as possible, otherwise it will taste more like a beer if a brut is used. Death in the Morning: this one is my own variation on Hemingway’s. Follow the above instructions and then add a healthy splash of orange juice to it. It is essentially a mimosa with absinthe and is a great way to salvage a failed Death in the Afternoon. Really informative, investigative post which ought to find a big readership. Just shows how a media bad press can affect reputation for decades. Kylie Minogue appears as the Green Fairy in 'Moulin Rouge'. It also reads as if it was fun to research! Since my last two blog posts were dealing with death and insanity, I thought it important to balance it with something lively and fun. Kahlil Gibran said he would rather his life remain both a tear and a smile and I have to agree with him; we cannot neglect the joyful side of life!